I’m doing the Off The Shelf Challenge in which readers pledge to read a certain amount of books that they already owned before the beginning of the year. All in an attempt to reduce the number of unread books on their shelves. I had a total of 31 unread books on my shelves before January 1st 2011. I pledged to read them all by the end of this year. In January I managed 11, 5 in February, and 3 in March, so the old-TBR (yes, I got “some” new books since), was 12 at the beginning of April. Now, how did I do in April and what were the books like? Further Tales of the City by Armistead Maupin. This book was one of the oldest (June 2010) on my TBR pile. I really didn’t feel like reading it, so I told myself sternly to read the first 30 pages and then make up my mind. I tried to give it a fair chance, but decided to give up after those pages. The book has a large number of characters, and most are silly rich city types, both of which I don’t like. The book moves from one character to the next, in very short chapters which I find confusing. And maybe in the eighties, when this book was published, it was great fun to read about gay people and drugs but I found it rather too obvious. Agaat by Marlene van Niekerk. This had been on my TBR since a book swap in September. I wasn’t really attracted to the book, but others at the book swap praised the book as being fantastic and a must-read. Finally I picked it up. 30 pages was too much, though. I gave up after about 20. The problem? The book was an assault on my brain. There were descriptions of places, surroundings, thoughts, and not just one or two, they followed each other in rapid succession, sometimes resembling stream of consciousness. Of course, I looked to see whether the rest of the book would be the same, and it looked like it would. So I gave up. The writing style doesn’t agree with me, unfortunately. Little Brother by Cory Doctorow. This is not a bad book at all. It’s dystopian, which I love. It’s also YA, which I sometimes like. And it’s an e-book, which has to be pretty good, or I’ll forget to read it. It’s not like a physical book that reminds you “Hey, read me!”. So I had this book going for a few weeks and I got about half-way. Not a bad story, but I had enough of it. It’s the story about Marcus, who fights against the government’s actions to prevent terrorism, but at the same time restricting the freedom of the people. Marcus makes clever use of internet and other technology but this turned into a bit of a tutorial on how these things work. His political stance was too often described in too much detail. I’m happy to have read half of the book, but I don’t need any more. Your Presence is Requested at Suvanto by Maile Chapman. 4 stars. A literary read about a sanatorium in Finland in the 1920s. Measuring the World by Daniel Kehlmann. 3 stars. About two German scientists in the 18th Century. That’s 5 books off the old-TBR shelf and 7 left. So, is the shelf getting a lot emptier then? Well, I do get new books regularly. In March, I got new books at a speed higher than I could read them, but this month has been good – or should I say: I have been good? There are now 23 books waiting for me (including the 7 from the old TBR). So, the net result since January (when I had 31) is minus 8, i.e., I have read 8 books more than that I got new in that period. So I’m reducing my TBR at the very slow rate of 2 books a month! How about you? How’s your TBR reading going? I had a total of 31 unread books on my shelves before January 1st 2011. I pledged to read them all by the end of this year. In January I pledged to read just books from that list. I managed 11 in that month and 5 in February, so the old-TBR (yes, I got “some” new books since), was 15 at the beginning of March. Now, how did I do in March and what were the books like? Only one book I didn’t like and two I was quite happy with. So, I’m glad I finally read these books. That’s 3 books off the old-TBR shelf and 12 left. Erm, I did acquire a few new books during the month. They were ARCs, books I won, and one or two from the library: 18 new books this month. Besides the 3 books mentioned already I read another 10 that were from the new-TBR (acquired since January). So that makes 8 extra books on my post-2010 TBR (which was 30 books at the end of February). The total new TBR since January is 38. In theory. I don’t think that number is completely correct. But hey, it’s a lot more than I can read in a few months! I had a total of 31 unread books on my shelves before January 1st 2011. I pledged to read them all by the end of this year. But I also pledged to only read from those 31 books during January to make a good start on this challenge. Now, did I succeed and what were the books like? You’d think, those books that you constantly reject when choosing a book to read, those wall flowers, they can’t be any good. I must have had a month full of awful books. There weren’t any brilliant books, but most of the books I read were “good”. There were 2 books very disappointing and that is a higher number than in an average month. But actually, both these books were given to me. I would not have chosen them myself. That’s 11 books off the shelf and 2 on the go. In addition I read one new ARC and I’m reading another one. Didn’t I do well keeping to my challenge! Erm, I did acquire a few new books during the month. They were ARCS, books I won, and books I borrowed from a friend. The total number of new books on my shelves is 12, one, an ARC, I read this month. So, that’s 31 old books, read 11, is 20 books. Plus 12 new books, read 1, is 31. Isn’t that what I started with this month?!! Well, at least I don’t have any more books! In March, I will again read only from my shelves. Can I reduce the number? Will it ever happen? How about you? Do you struggle to keep the number of unread books down? What’s your strategy? 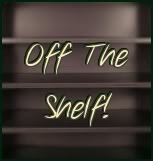 Bookish Ardour is hosting the Off The Shelf Challenge. That’s my sort of challenge! Have you seen the unread books on my shelf? I’ve got… 30+! Ok, you don’t find that much, you’ve got way more? Well, I think books are for reading and these 30 keep me awake at night, wondering when I will be able to read them. Then I get new books from the library, from giveaways or for reviews, and all is forgotten. That’s right, I’ll be reading the new books and forget about my old loves. Now, in my favor it must be said that none of these are older than a year, because at the beginning of 2010 I didn’t have that many books and generally I used to read all my books before I got new books. Now, it’s running out of hand, hence the challenge. The levels you can choose from for this challenge are 5, 15, 30, 50, 75, over 75, over 125. I’m going for Making a Dint which means that I’m to read 30 books (or however there are on my unread pile by January 1st 2011). If you’d like to join in too, sign up at Bookish Ardour now! This challenge, together with the challenge that I host myself (the Book Bloggers Abroad 2011 Challenge) will be the main challenges that I’ll take part in. I will do some other challenges (post about these to follow), but for those I’ll read only a few books.